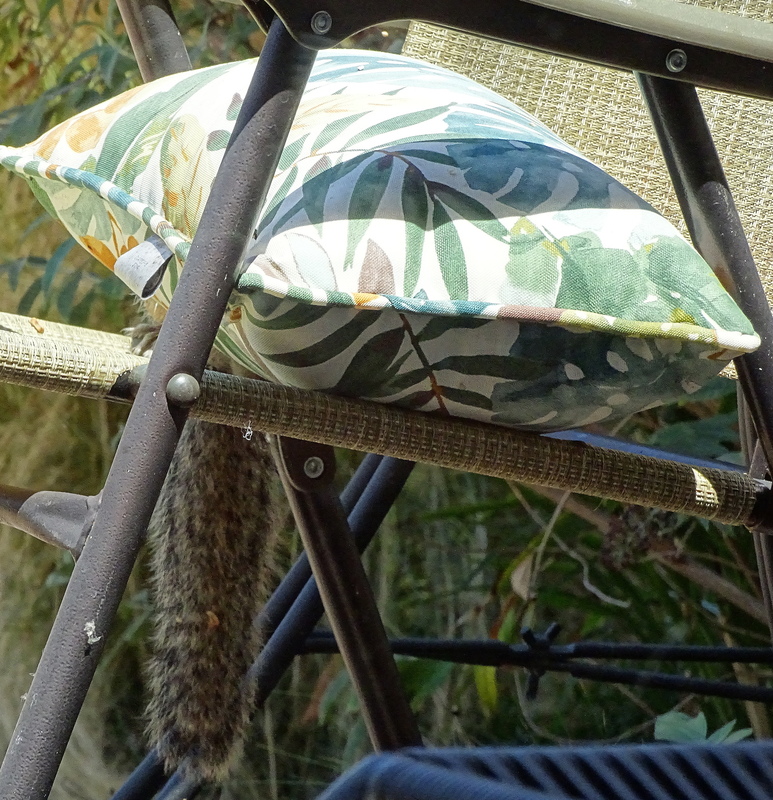 Squirrel Nutkin has his favorite chair, where birdseed falls on his head like manna, unasked for, from heaven. It’s perfect place for pillow-hiding where no one can see him at all, if only it weren’t for his tell-tale-tail! and perch on his chair like a king on his throne. 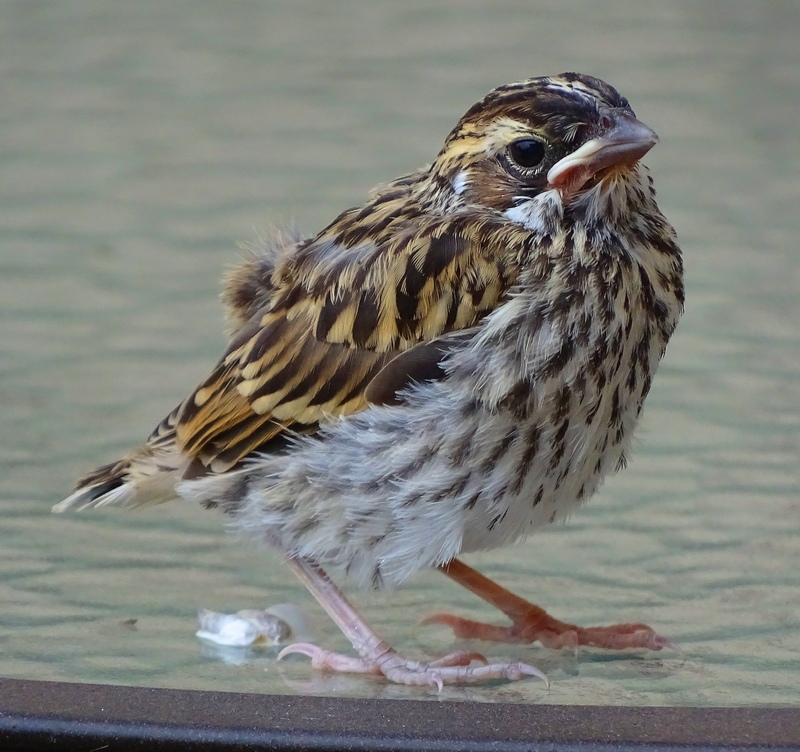 Baby-Bunting-Birdie is confused by all the action, but never hops by without leaving a gift, so thoughtful! 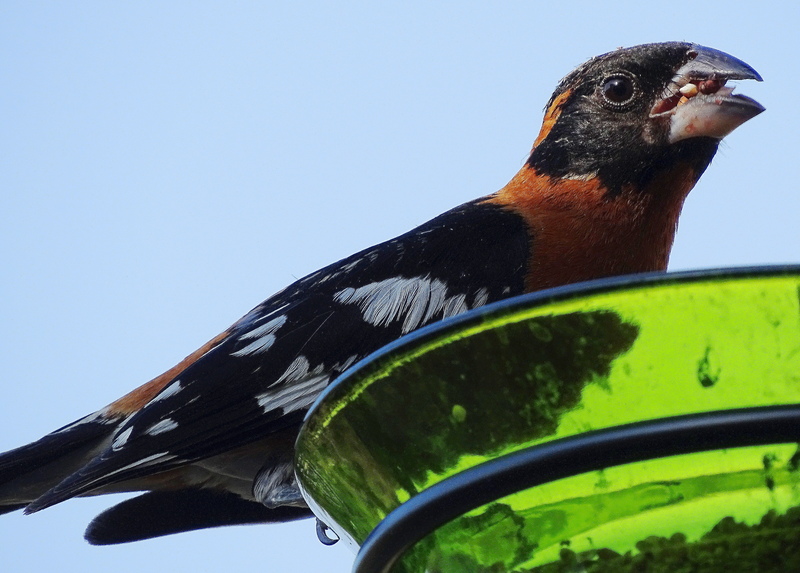 The Grosbeaks create the showers of seeds while stuffing their beaks past full. The docile doves just watch the show. (Thank you Ms. Potter for many happy childhood reads about Squirrel Nutkin and all his animal friends). These pictures are too cute – so I nominated you for an award! Apologies if you’re award-free…just wanted to send my regards! Awwww, much appreciated and cheers to you! You make even the ordinary extraordinary…and hilarious, Cindy! 😀 Thanks for giving me a huge smile with your Holler critters! They would love you too Dor as I do! 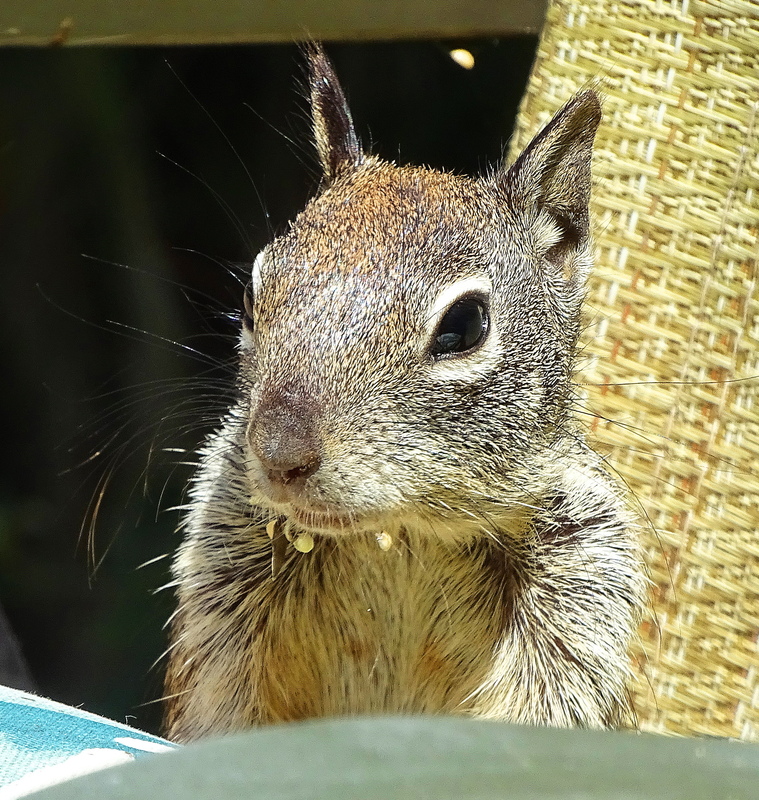 What a precious little face – I just love squirrels. Great shots. Happy 4th! More vain really…they preen and primp to far greater effect too!!! Hey Cindy- a while ago I asked you what camera you used (birds pics). And you told me and do you think I wrote it down? Could you tell me again. I think a cannon? It’s a Sony HX400 and Happy 4th to you Cate! Such cuties, especially the thoughtful little chick. Beautiful pictures and the narrtive, Cindy! We have a smaller chick now who fell out of his nest in our central coutyard. Mama makes occasional feeding visits, and he is almost fully fledged and can perch, so it is my hope he will survive without my intervention. Gorgeous birds and what a sky! Thank you, t’s nice out here with all the critters and lots of open space. Love your squirrel photos Cindy. My daughter is starting A level Photography this September. She will be getting a proper camera – can’t wait to see what she does….and to pinch her camera!! Watch out squirrels!! Cindy, tt’s always such a pleasure coming to your blog and viewing the photos, but this one made me laugh! You are officially accepted now and they will never need to do this again. Unless of course you go to a different place. If you still like seagulls after this experience, then you are truly a friend of the birds, and they will know this. It’s uncanny, but they do. They are smart in reading people. I love squirrels. Beautiful photos!!! So pleased you enjoyed and thank you too! 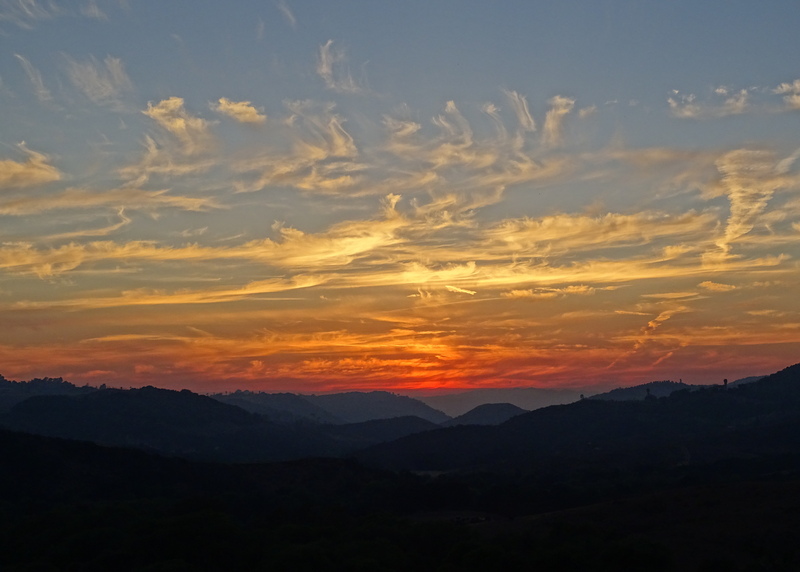 Beautiful photos, especially the sunset. Happy Independence Day Cindy! Happy 4th my friend and cheers to you too! Your lovely words and peaceful critters at the Holler brought a smile of sweet appreciation to me, Cindy. Photos, as always, are such a treat. What beauties, except for the squirrels, you are welcome to mine. The critters are pretty darn cute and I think they know it! Thanks and cheers back to you! 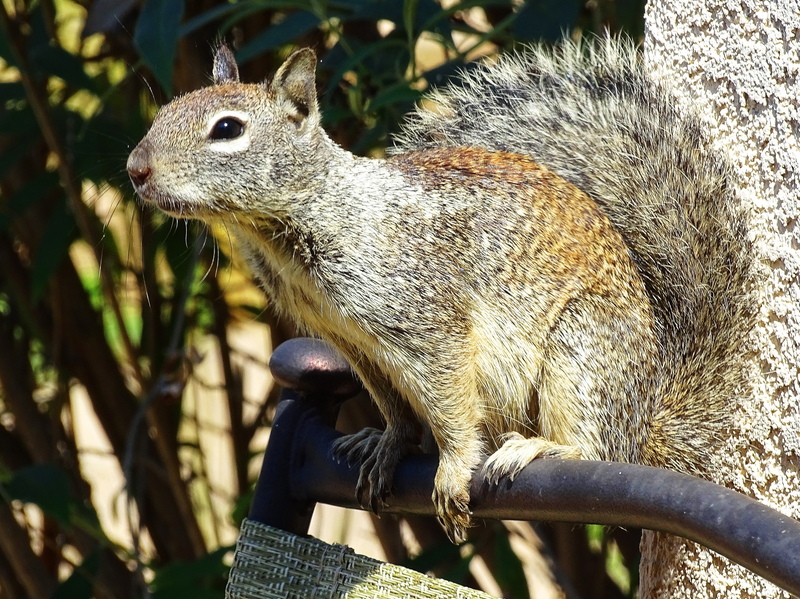 Squirrels are such fun to watch once you figure out how to keep them out out of the bird feeders. I’d love to know how to keep squirrels out of bird feeders permanently, rather than temporarily. They even manage to suss out the so-called “squirrel-proof feeders” pretty fast. Just like bee proof bird feeders, although I did find a solution for this, A thin line of vegetable oil on the feeding ports completely stops bees, even swarms! If I find a solution for the squirrels, I will let you know! 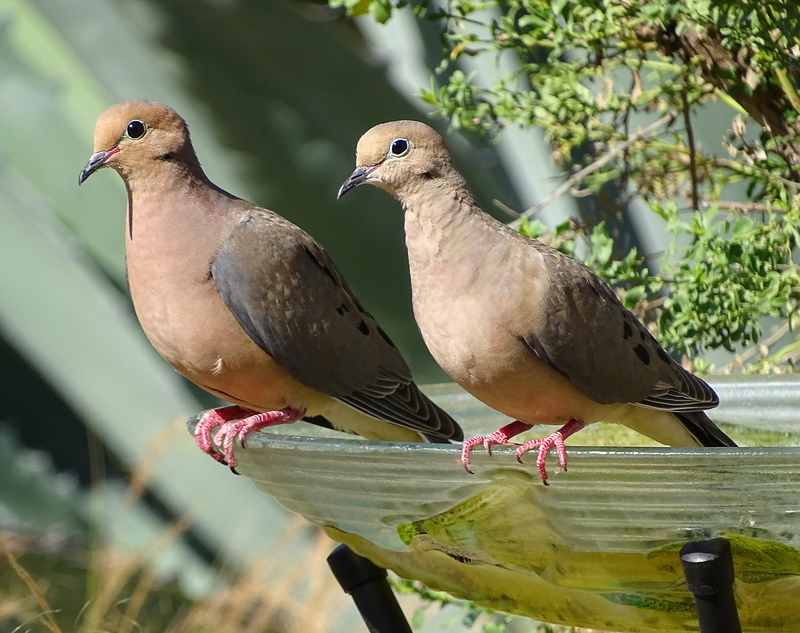 Sarah – With multiple open bird sanctuaries on our property, when we lived in North Carolina I had to find a way that worked on over 40 feeders. I placed each house at the top of a 5 or 6 ft. Rebar pole (your lumber company will cut various lengths for you). While you are out, go to your farm supply store and buy the softener dairy farmers use on their dairy cows udders to keep them from getting dry and cracked. I always preferred the squeeze tube but it’s more expensive than the jars. (Great stuff for cuticles and rough heels). When the pole and the feeder are up and secure, slather the utter cream on the pole as thick as you can. 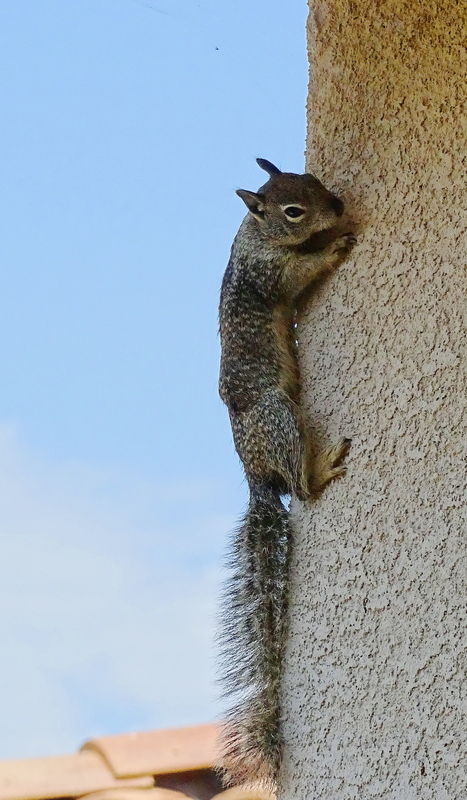 Trust me, your squirrels will have the softest paws in the state and its great fun to watch them slide down the pole. Depending on your weather conditions, that will determine how often you have to apply the utter cream. One of these days I’ll do a blog on keeping up the 3 acres for the wildlife. My e-mail is sdegrom@conwaycorp.net I if you have thoughts or questions. Sheri, that sounds like an excellent solution to the squirrel problem, and with great entertainment value, too! Now to find a farm supply shop that stocks the udder softner. It’s mostly sheep-farming and arable where I live. Thanks so much for providing that info. Sarah – If you don’t find it, you should be able to order it on line through a farm supply store. It’s also great for those cuticles. Another thing Dad and I did [oh how I miss him and his inventive mind] – we went to the farm supply store and asked if they had any baby chicken watering devises. I purchases two and Dad rigged them so they hung over the top of the bird feeders I wanted to hang from trees. I covered the tin watering pan portion that’s turned upside down over the birdhouse (we used a weather-proof cord) and then put the udder cream on it and affixed it to the top. Oh the mad squirrels. The birds liked it as it kept their food nice and dry. I was nice to the squirrels and other critters. I fed critter food along the back 2 acres of our property where a brook ran through it as well as I had 12 squirrel feeding post for corn on the cob. I loved living in that environment. Building the Bob White Quail population, the North Carolina Blue Bird, Red Carnial and White Barn Owl were all victories in the 3 years we were there. I miss those victories. Let me know if I can be of any help. One of these days I’ll scan those pictures of NC and you can see them for real. Sheri, I love hearing about your innovative ways of keeping the wildlife happy, even those impish squirrels! Thanks for telling me all about your various contraptions . Those birds sound wonderful. I’m particularly fond of owls. We have Tawny owls in the woods up the road from where I live. I just read in a magazine and now I can’t remember which one, someone is making a substance that sounds like the udder gunk. They’ve packaged it nicely and gave it a sweet name. I bet it still makes a mess. Interesting and ingenious Sheri. Thanks for sharing. It is the same concept for the bees, except you coat the bird feeder ports with a light coating of vegetable spray. I buy the aerosal. This works like a dream in keeping bees and wasps off your feeder. I will try the udder cream. My husband has some. Yes, my husband uses it. It’s called Udderly Smooth. There is another brand called Bag Balm which is the real stuff! I like the name Udderly Smooth. It’s much more attention-grabbing than Bag Balm! Yes, it is so excellent that Squirrel Nutkin appreciates Ms. Potter. You post the most soul-filling posts, Cindy. I absolutely love the little squirrel.